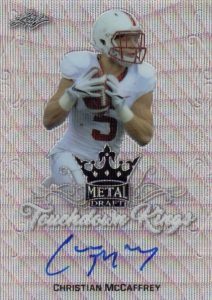 Again offering collectors an early shot at hard-signed cards for the biggest names heading into the NFL Draft, 2017 Leaf Metal Draft Football is an all-hit release. Every box includes five on-card autographs. Like in 2016, the hit-focused set only has signed cards with several different options. 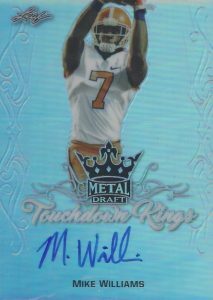 The base Metal Autograph works with a simple design while themed autograph inserts like Armed and Dangerous and Touchdown Kings add a few more elements to the layout. State Pride highlights the player's beginnings with a flag background. 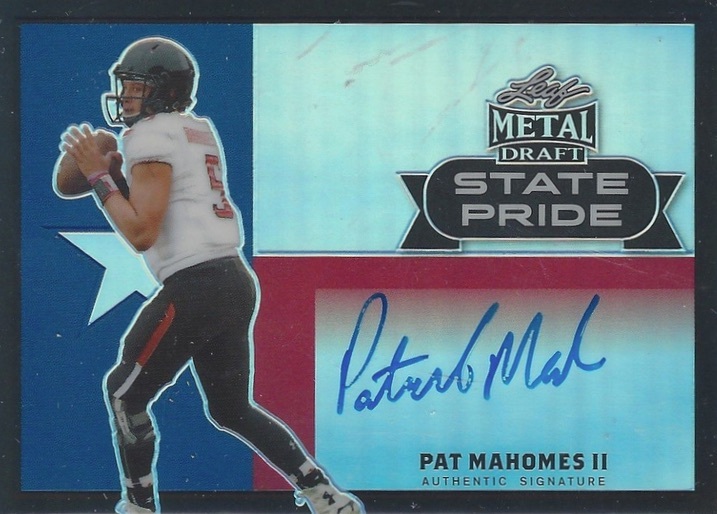 Looking to the recent past, Flashback autographs utilize the '16 design for those players who opted to spend another year in college before entering the '17 draft. 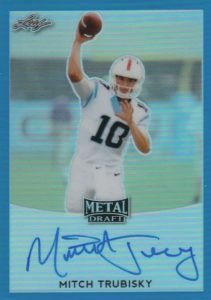 2017 Leaf Metal Draft Football is further enhanced with multiple Prismatic parallels, including one-of-one Gold Superprismatic. There is also an extra mystery parallel with an unknown print run that won't be revealed until 20 days after the product is released. 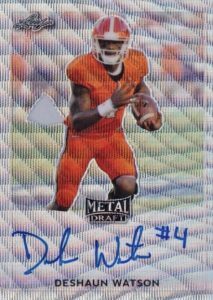 Among the many names featured in 2017 Leaf Metal Draft Football, standouts include Deshaun Watson (QB - Clemson Tigers), Dalvin Cook (RB - Florida State Seminoles) and Christian McCaffrey (RB - Stanford Cardinal). C.J. BEATHARD 2017 RC Rookie Auto SSP Leaf Metal Draft Wave Foil only 40 made!! 2017 Leaf Metal Draft Mitch Trubisky Rookie Auto Purple 6 25. 71 cards. 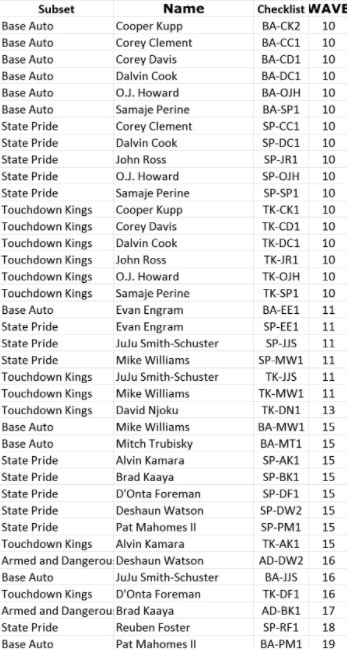 Redemptions noted below. Shop base autographs on eBay. PRISMATIC PARALLEL CARDS: Wave Foil SP*, Blue #/50, Purple #/25, Pink #/20, Black #/15, Green #/10, Red #/5, Gold 1/1, Super 1/1, Plates 1/1. 14 cards. Redemptions noted below. PRISMATIC PARALLEL CARDS: Blue #/50, Purple #/25, Pink #/20, Black #/15, Green #/10, Red #/5, Gold 1/1, Super 1/1, Plates 1/1. PRISMATIC PARALLEL CARDS: Wave Foil SP*, Blue #/35, Purple #/25, Pink #/15, Black #/10, Green #/5, Red #/3, Gold 1/1, Super 1/1, Plates 1/1. 37 cards. 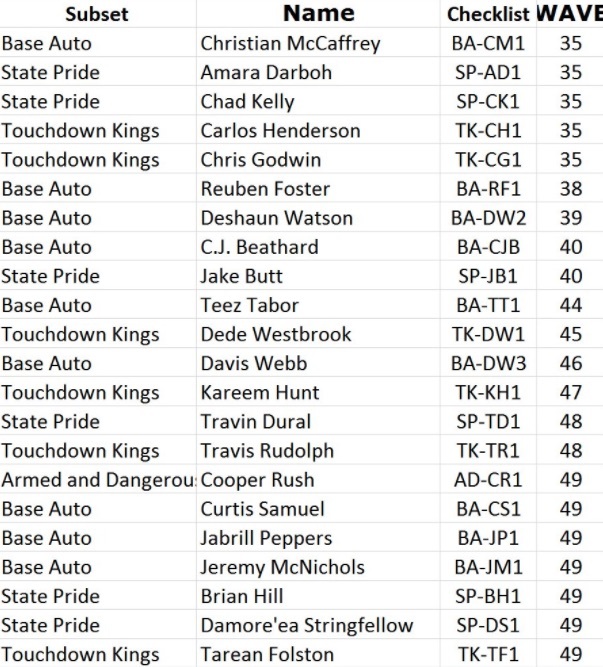 Redemptions noted below. Shop on eBay. PRISMATIC PARALLEL CARDS: Blue #/25, Purple #/20, Pink #/15, Black #/10, Green #/7, Red #/5, Gold 1/1, Super 1/1, Plates 1/1. 30 cards. Redemptions noted below. Shop on eBay. Shop Wave parallel autographs on eBay. 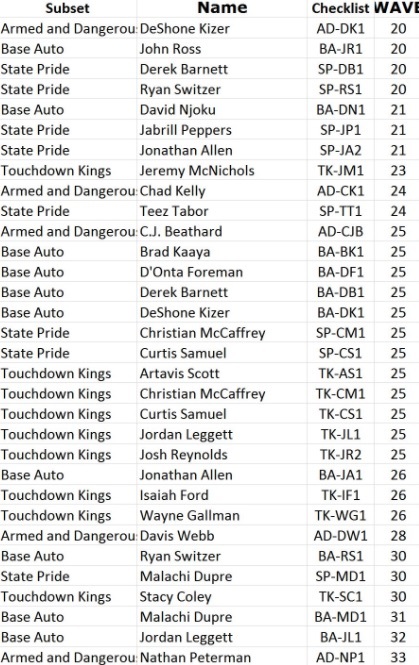 Final print runs noted for each player in the images below. Click on each of the thumbs for a detailed breakdown. James Quick isn’t listed on the prismatic wave print run. So many big hits in my case. 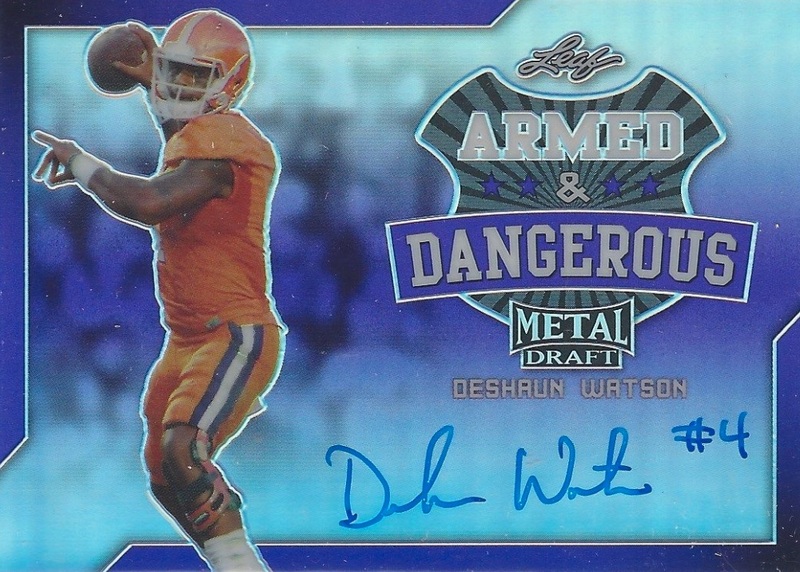 Watson, Trubisky, Mahomes, McCaffrey, Peppers etc….. Click to check out my pulls! One of the best products out there, Period…end of story. 2017 LEAF METAL ARMY FOOTBALL SEALED BOX TUA TAGOVAILOA JAKE FROMM JK DOBBINS?